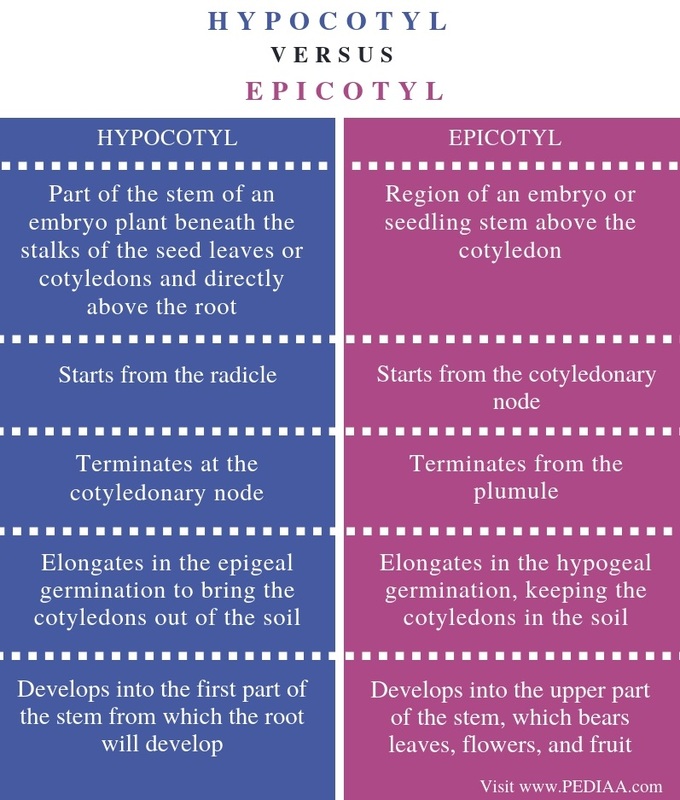 The main difference between hypocotyl and epicotyl is that the hypocotyl is between the cotyledonary node and the radicle whereas the epicotyl is between the plumule and the cotyledonary node. Furthermore, the hypocotyl elongates to bring the cotyledons out of the soil in epigeal germination while the epicotyl elongates in the hypogeal germination, keeping cotyledons inside the soil. Hypocotyl and epicotyl are two structures occur in the embryonal axis during seed germination. Both are important in discriminating between the epigeal and hypogeal germination. The hypocotyl is the part of the seedling stem found between the cotyledons and the radicle. It is the main elongation part of the plant, which ultimately develops into the first part of the stem. The radicle is the part occurs at the end of the hypocotyl, which develops into the root. Hypocotyl emerges after the radicle, marking the development of first leaves called cotyledon or seed leaves. The growth of the hypocotyl is stimulated by light. Also, light determines the rate of growth of the hypocotyl in a process known as photomorphogenesis. 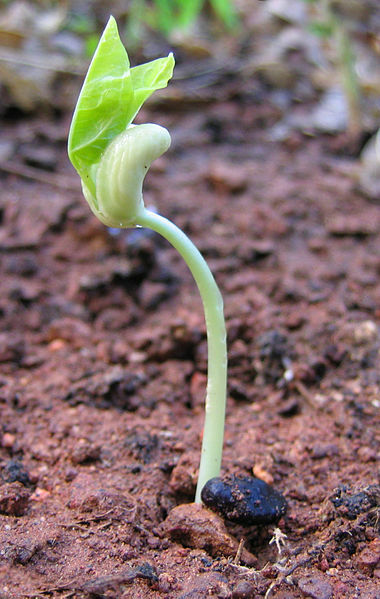 The elongation of the hypocotyl encourages the seedling to lift out from the soil in epigeal germination. In some plants such as Gloxinia and Cyclamen, hypoctyl swells up to store food. In plants that show hypogeal germination, the hypocotyl only grows up to several inches above the ground. Epicotyl is the part of the seedling stem found between the cotyledons and the plumule. Cotyledons are known as seed leaves while true leaves develop from the plumule. In hypogeal germination, cotyledons stay in the ground due to the short hypocotyl. Hence, epicotyl is the structure responsible for the elongation of the embryonic shoot from which the true leaves develop at the apex. In gymnosperms, the coleorhiza is the first structure to develop from the seed, which serves as the covering of the root followed by the coleoptile, which covers the leaves. Hypocotyl and epicotyl are two structures in the embryonal axis of a germinating seed. They occur in the seeds of angiosperms. Both can be elongated; their elongation is responsible for the determination of the type of germination. 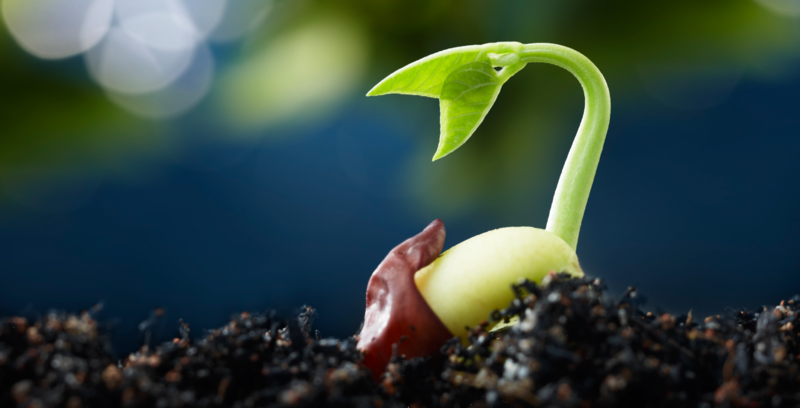 The hypocotyl refers to the part of the stem of an embryo plant beneath the stalks of the seed leaves or cotyledons and directly above the root while the epicotyl refers to the region of an embryo or seedling stem above the cotyledon. The main difference between hypocotyl and epicotyl is the origin and termination of these two parts. Hypocotyl starts from the radicle while the epicotyl starts from the cotyledonary node. Hypocotyl elongates in the epigeal germination to bring the cotyledons out of the soil while epicotyl elongates in the hypogeal germination, keeping the cotyledons in the soil. This is another important difference between hypocotyl and epicotyl. Hypocotyl develops into the first part of the stem from which the root will develop while epicotyl develops into the upper part of the stem, which bears leaves, flowers, and fruit. Hypocotyl is the part of the embryonic stem that occurs between the radicle and the cotyledons while epicotyl is the part of the embryonic shoot, which occurs between the cotyledons and the plumule. Hypocotyl extends in epigeal germination to bring the cotyledons out of the soil while in hypogeal germination, epicotyl extends while hypocotyl remains in the ground along with the cotyledon. The main difference between hypocotyl and epicotyl is their relative position in the embryonic plant and the role in seed germination.